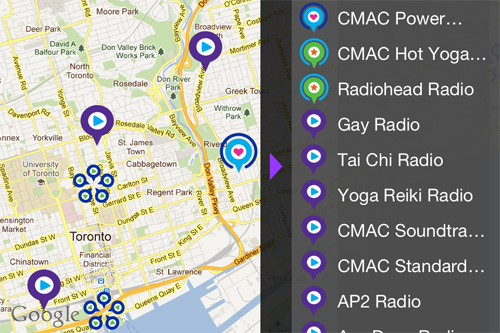 Android users will be happy to see a free new music service amongst my app reviews this week for Moore In The Morning on Newstalk 1010. I also take a look at one of the handiest little tools for drivers and a new Wildlife Field Guide for the iPad from the Toronto Zoo, highlighting their work with species at risk. Raditaz is a free, streaming music service that offers access to 14 million songs for free. The twist is that you can’t select a specific song or album. Instead you type in the name of a favourite musician or band and it creates an unlimited playlist based on that artist. Type in David Bowie for example and you’ll get a mix of David Bowie songs and others that match his style and genre. Now, you can get creative and type in any descriptive word you like – happy, break-up, victory, monkey, and see what kind of mix it creates. You can try to control the mix by skipping tracks and indicating the ones you love or hate to keep personalizing it to your taste. If you choose to share a mix you’re listening to, Raditaz treats you as if you’re a virtual radio station, broadcasting your mix to others in your neighbourhood. 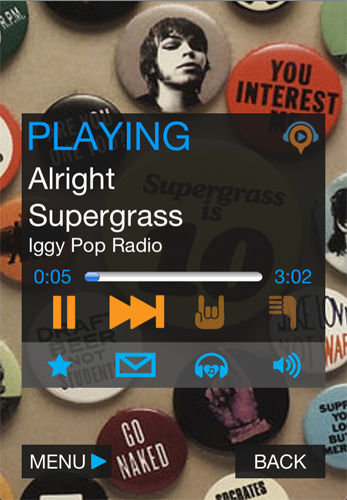 A GPS search pulls up nearby users and you can listen in to their mix with a quick tap of the screen. I did a search in downtown Toronto and found someone sharing music from their boat on the harbourfront, a beacon pulsing from out on the lake. The sound quality’s great, the menus are fun, and the music selection is massive. A handy little app for drivers, ParkBud turns your phone into a meter that matches the one you’ve fed coins to on the street. The timer on your phone perfectly matches the time left on the meter, and it will sound a little reminder alarm so you can get back in time before it expires. It uses GPS to help you find local parking garages, remembers the exact spot where you’ve parked, and even maps out a walking route to guide you back so you can’t get lost. 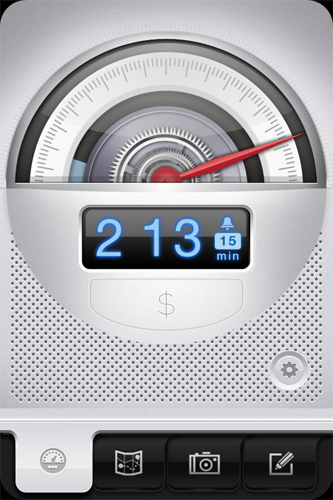 It has a Note sections you can use to record details or take photos of nearby traffic signs for future reference. The animated controls are really slick, and with cool sounds it makes for a fun, futuristic tool. The Toronto Zoo has selected seventy of their most threatened species to create an exhaustive, rich learning experience for the iPad. From Spider-Monkeys and Tapirs, to Komodo Dragons and Red Pandas, each animal is celebrated with gorgeous photography and detailed in essays that describe what makes them unique, what region of the world they are from, and where they stand in terms of approaching extinction. There are surprising videos, animations, and cool 3D models creating a slick, well-made touchscreen experience. This could have been a cheesy, come-to-the-zoo pamphlet disguised as an app, but instead it’s something far more sophisticated and thoughtful. 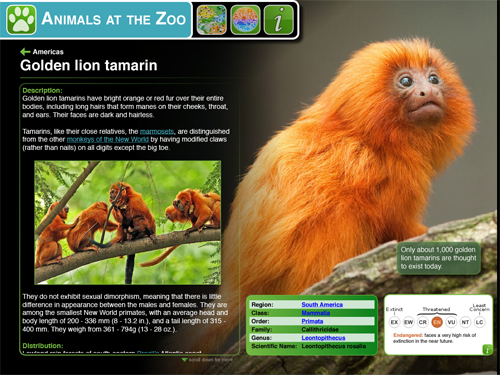 You can browse through it like an encyclopedia or follow along with a map of the zoo to help you read up as you visit each of the animals. I love that they include a few tidbits about zoo life such as comparing what the animals eat in the wild to what they eat in the zoo. One of the Silverback Gorillas, the app tells me, has made paintings that have sold for as much $37,000. Responsible zoos play an essential role in wildlife conservation, captive-breeding programs, and biodiversity education. A part of the money you pay when you visit animals in a zoo will go on to help their cousins in the wild. For many, their first encounter with a wild species will take place at a zoo and this app expresses the efforts made by Toronto Zoo staff to enhance that experience with knowledge and respect. You would think the parking meter app would be free, its nice but not sure if I would pay for it.